Join the San Diego River Park Foundation at the San Diego River Garden as we care for a wonderful collection of California native plants and trees at this five-acre location in Mission Valley. 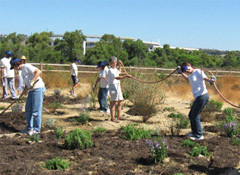 Activities include trail maintenance, weeding, watering, pruning and other light gardening projects. This is a family-friendly event and no experience is needed. Community service hours can be verified.